The Tipping Point for GMOs is coming near. Their dangers will be exposed. Their time will pass. It’s a matter of when, not if. As a supporter and speaker for the Yes on Prop 37 campaign, it is a sad day. The millions Monsanto dumped into California to buy their way out of losing profits worked, for now. But this is an issue the intelligent will not leave to our government, state or national. This is an issue each of us must take on before our food reaches our tables. We must vote in the most powerful way possible, with our dollars! Companies must make money. That is a good thing. It is what what keeps prices competitive and innovation happening. As consumers, we change the market with our demands; the companies that do the best job of supplying our demands will make the profits they seek. This should be a win-win situation! If you don’t realize how powerful your demands are as a consumer, look at how even a corporate giant like Walmart ditched the rBST milk when consumers demanded it. They want our money – therefore what we want to spend our money on matters to them. Use your power. Get Free Help: Here in California, we were hoping for help in the way of labels, but just because we didn’t get it doesn’t mean we don’t have help! 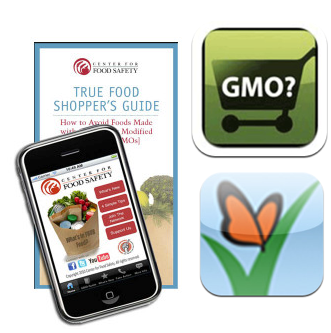 There are three great apps that can help you find a GMO-free version of whatever you need; pancake mix, cookies, crackers, bread, you name it! Shop No GMO, The True Food Shopper’s Guide to Avoiding GMOs, and the Non-GMO Project Shopping Guide. Speak Up: Talk to your food retailers. Tell them you want Non-GMO foods. Ask them to show off the GMO-Free foods they offer in an end-of-isle display or special section of the store to help you make fast, easy selections. Remember, they want your money and they are willing to work for it. Spread the Word: Share knowledge about GMOs in fun and easy ways. 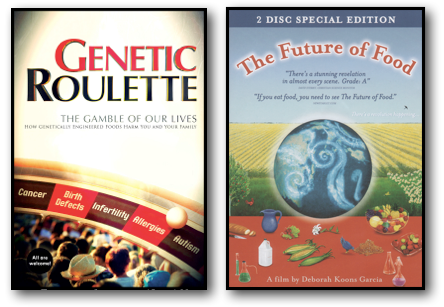 Send your friends links to movies like Genetic Roulette or The Future of Food. Better yet, have a screening party at your house with yummy GMO-Free foods. Your friends and family may have no idea about GMOs and what they are. Even if they do, they may be blindly trusting our government to protect them. The can’t protect themselves from what they don’t even know is entering their bodies and that of their children. Use the contact page here on the site to let me know when you are having an event. I am happy to Skype in to support your group and answer questions. Comment below to share how you will Say No to GMOs.